No kitchen is easier to work in than a large kitchen with a workhorse of an island. Each cabinet area has its’ purpose, and the island stands solid, waiting for whatever utility the stove, sink, children, or the guests may require. This is an island designed for an active family on the go. The walnut wood top welcomes use whether for kitchen utility, games, homework or eating quick meals. Time will bring a patina of ambiance and memories while the rich color of the walnut counter warms the kitchen when the stove is not in use. The details of furniture style cabinetry, large corbel support brackets and the slight shifts in the surface of panels, each provided by the eye of a designer cabinet-maker that conspire to promote a sense of new and old in a home serving the modern family. 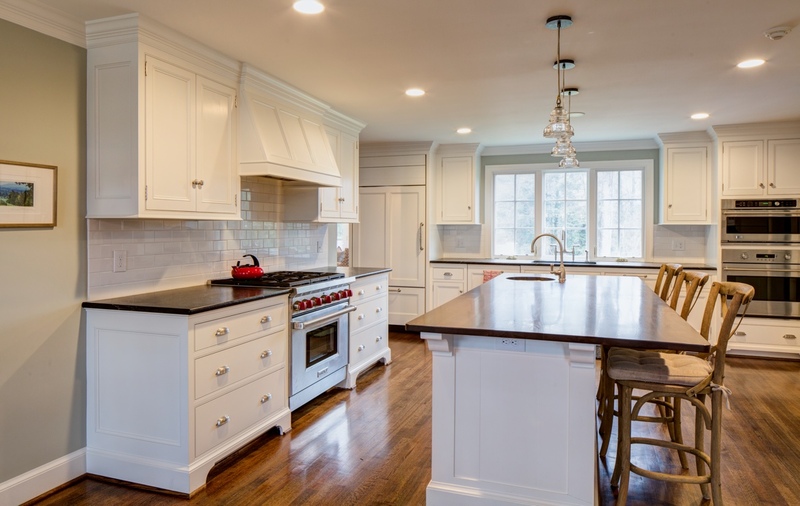 Let Jaeger & Ernst custom cabinetmakers provide a new kitchen with details for you!